We appreciate your interest in serving in Nepal. We have some areas where volunteering help are needed. We accept volunteers and they must be Christian. They must have good character, healthy, not young not old, who loves orphans and the Lord Jesus Christ, who don't drink, smoke, and attend church regularly and who loves the things of the Lord and not of the world. Volunteering will not only help the needy community, it will also help you gain experience in your field of choice and learn about a new culture and language. During your period of volunteering, we will arrange for your lodging, food and other logistics required and also travel to and from the volunteering site. We have internet in most of the volunteering site, clean water, and river bath in some places. We would like you to contribute financially to help us serve you better, this includes food, electricity bills and room. Micro oven, freezer, washing machine and dryer machine, car, and guide are always there. If you are interested or you want to know how we could help you, then write to us. We would love to hear from you. 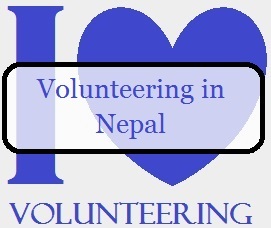 Volunteering in Nepal is a wonderful way to gain some experience and give back to the society. Volunteering will not only help the community, it will also help you gain experience in your field of choice and learn about a new culture and language. It can also serve you the purpose of working holiday as the moment spent in beautiful place like Nepal will be no less then a holiday. We organize volunteering opportunities for interested individuals and groups in various needy sectors including renovation and construction of the school for poor children who needs education. Housing for the orphans, widows and poor children. You can also visit villages and interact with the people who have never seen foreigner come to their houses and you also will never forget the service and friendship they will make to you. Travel with us as we go to most beautiful sites in Nepal to help deserving communities with what they need. Nepal During the period you are volunteering, we will arrange for your lodging, food and other logistics required and also travel to and from the volunteering site. It is so wonderful and awesome to work in the lap of the Himalayas. Other areas like video, fund raise, medics. We are waiting for you to come and serve in Nepal. Bless Nepal at your most. If you are interested please write us. Volunteering in construction of homes and Church that are destroyed need at least two weeks to 3 weeks. If you serve among Orphan children then you could do that from three days to weeks. If you want to teach in School you could be there for two weeks to four weeks or more. People can come for a week to a month, from a single healthy, non-smoking wise person to a group can join with us. 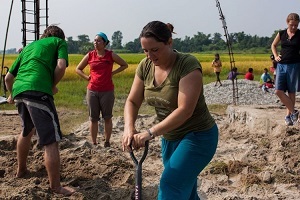 Sites for contruction will be anywhere in Nepal, but mainly on Earthquake damage areas or where the need is most. As you know that volunteers will not be paid, they need to contribute money to help cover up food expenses. So charge is fix when place you volunteer is determined. Village is reasonably cheap. But city too does not cost much. Please join with us or recommend friends to us who don't smoke, drink, love God and His people, attend Church regularly and wise and kind hearted. Once you decide to come to Nepal, write us with your interest to serve in Nepal. Send us your confirmed Air Ticket schedule and a copy of your Passport and Visa. We will tell you the rest.